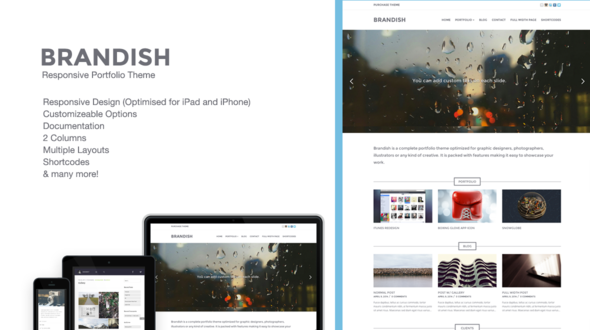 Brandish is a complete portfolio theme optimized for graphic designers, photographers, illustrators or any kind of creative. It is packed with features making it easy to showcase your work. Theme options - make changes to the theme and implement your own styles to fully customize the website to your liking. Custom logo - as well as an avatar you can upload your own image to replace the text logo. Custom background - supports WordPress built in custom backgrounds, choose a colour or image to use as your background. Shortcodes - Symple Shortcodes included in the theme giving you access to multiple shortcodes including buttons, sections and tablets. Widgets - The theme supports sidebars in the footer and header/sidebar. Internet Explorer 9 and 10!